Note: Bulging at the bottom of the container is normal and occurs with elevation change during shipping. Optimal Liposomal Vitamin C provides 1000 mg of all natural Vitamin C per serving. Optimal Liposomal Vitamin C utilizes consistent 150 nm sized liposomes which facilitate this high potency Vitamin C. The phosphatidylcholine is non-hydrogenated and is derived from tested GMO free ingredients. The fantastic lemon flavor is 100% natural and kids love it too! This is a non-soy formula. The benefits of Optimal Liposomal Vitamin C are almost endless and can help support the immune system, connective tissue, skin and recycle glutathione. 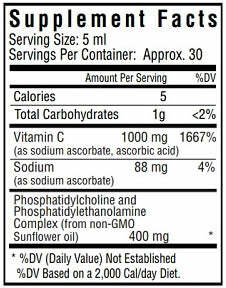 Optimal Liposomal Vitamin C helps provide natural phosphatidylcholine - not hydrogenated phospholipids. Shelf Life : Commonly two years+ from manufacturing date for all Liposomals.